Researchers at Virginia Tech believe that Hurricane Sandy may have created the ideal nesting habitats for piping plovers, which are an endangered species in New York, and a threatened species nationwide. Though Hurricane Sandy brought a force of destruction that devastated much of Long Island and the surrounding tri-state area, researchers at the College of Natural Resources and Environment at Virginia Tech think that it may have been a blessing in disguise for piping plovers. The tiny piping plover is a delicate shorebird that migrates in the spring to nest on sandy beaches, and is considered an endangered species in New York and a threatened species nationwide. Though swaths of sand that was pushed beyond the shoreline during the hurricane may be seen as an annoyance by people, plovers will benefit from a more vast habitat range. “Hurricane Sandy pushed sand over the vegetation of the barrier islands, leaving behind wider sandy beaches, which is the plover’s preferred habitat,” said Jim Fraser, professor of wildlife conservation at Virginia Tech, who has studied the piping plover populations on the beaches of West Hampton Dunes for over a decade. The diet of piping plovers consists of insects and invertebrates that can be found in intertidal flats, which are shallow, wet areas on the bay side of barrier islands. Now that barrier islands are being shaped as a result of recent storms, Fraser expects the population to surge when the birds come back to nest in the spring. As a result of Hurricane Sandy, three inlets have formed on the South Shore, which largely changed the landscape of the shoreline. The U.S. Army Corps of Engineers quickly filled in two of the inlets, but the remaining one formed in a protected wilderness area on the Fire Island National Seashore. The Fire Island inlet is to remain open, and is New York's only natural inlet. Fraser expects it to be a boon to the piping plover population, as well as for taxpayers. “Post-storm public works projects are incredibly expensive. Ultimately, the taxpayer ends up footing the bill," said the professor. Pictured in Featured Photo: The federally threatened piping plover nests along the Atlantic coast from North Carolina to Atlantic Canada. Photo by Sid Maddox ©2004. 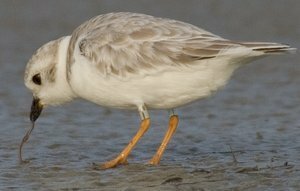 Subject: LongIsland.com - Your Name sent you Article details of "Hurricane Sandy a Blessing in Disguise for Piping Plovers in Search of Sandy Areas to Nest"